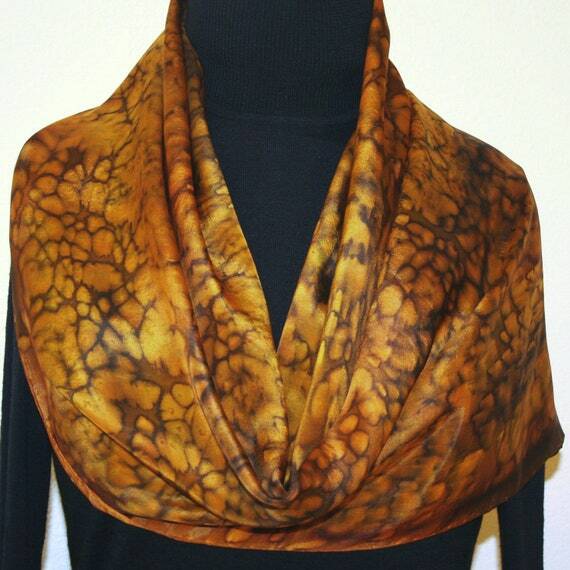 Brown Silk Scarf Brown Handpainted Handmade Silk Shawl GOLDEN PRAIRIE, by Silk Scarves Colorado. Select Your SIZE! Birthday Gift, Christmas Gift, Anniversary Gift. Bridesmaid Gift, Valentine Gift. Gift-Wrapped. Elegant Handmade Silk Scarf. Hand Dyed Silk. Handmade in Colorado, USA. 100% silk. This is a 100% habotai silk (smooth China silk) scarf in shades of brown, terracotta, and golden terracotta. Decorated with thin accents in gold. It is a chic and elegant silk scarf that makes a great accessory to any outfit. 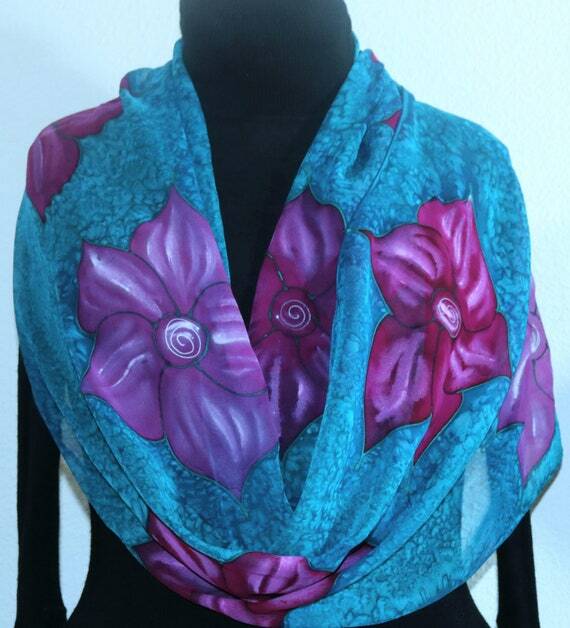 Teal Lavender Hand Painted Silk Scarf Handmade Chiffon Silk Shawl RAINFOREST FLOWERS, by Silk Scarves Colorado. Select Your SIZE! Birthday Gift, Christmas Gift, Anniversary Gift. Bridesmaid Gift, Valentine Gift. Gift-Wrapped. Elegant Handmade Silk Scarf. Hand Dyed Silk. Handmade in Colorado, USA. 100% silk. This is a 100% Chiffon silk scarf featuring stylized pink-and-violet flowers scattered on a teal and turquoise background. , by Silk Scarves Colorado. Select Your SIZE! Birthday Gift, Christmas Gift, Anniversary Gift. Bridesmaid Gift, Valentine Gift. Gift-Wrapped. Elegant Handmade Silk Scarf. Hand Dyed Silk. Handmade in Colorado, USA. 100% silk. Orange Purple Pink Silk Scarf Handpainted Handmade Silk Shawl SUNSET WATERS, by Silk Scarves Colorado. Select Your SIZE! Birthday Gift, Christmas Gift, Anniversary Gift. Bridesmaid Gift, Valentine Gift. Gift-Wrapped. Elegant Handmade Silk Scarf. Hand Dyed Silk. Handmade in Colorado, USA. 100% silk. 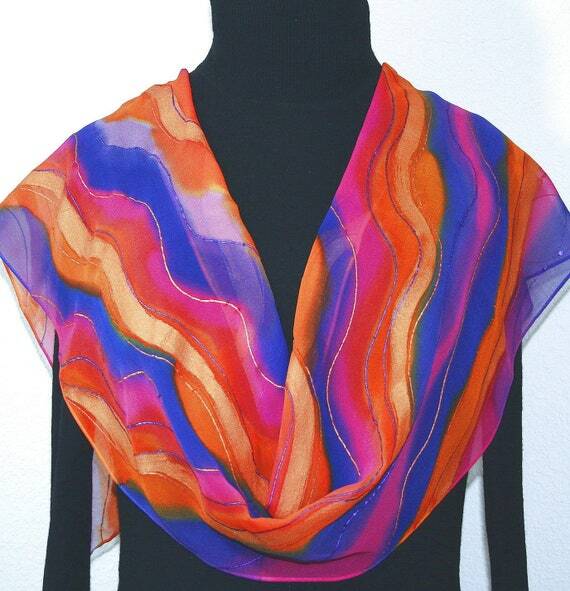 This is a 100% Chiffon silk scarf featuring wavy lines n soft shades of purple, lighter and darker pink, and orange. Decorated with metallic wavy lines and accents in bronze. It is a chic accessory for any type of outfit. 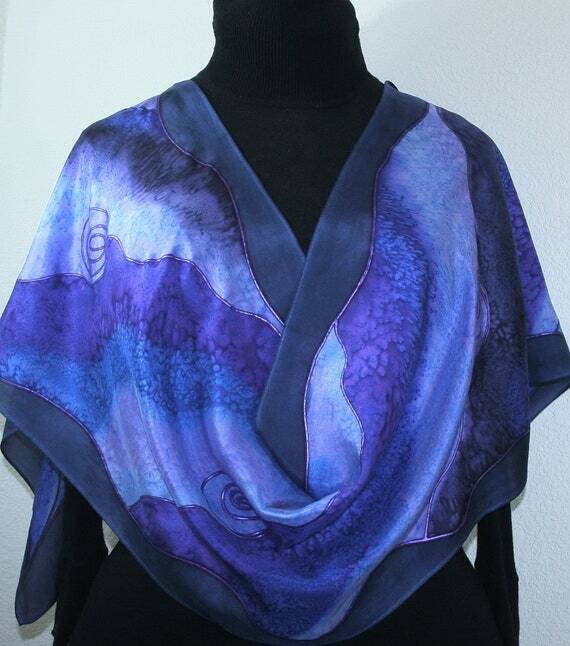 Silk Scarf Lavender Purple Blue Hand Painted Silk Shawl PURPLE WATERS-2, by Silk Scarves Colorado. Select Your SIZE! Birthday Gift, Christmas Gift, Anniversary Gift. Bridesmaid Gift, Valentine Gift. Gift-Wrapped. Elegant Handmade Silk Scarf. Hand Dyed Silk. Handmade in Colorado, USA. 100% silk. This is a 100% smooth silk (aka. Habotai silk) scarf in soft shades of darker and lighter purple, aubergine, lavender, violet, periwinkle. The scarf has a border in darker shade of sapphire blue . It is a colorful and chic accessory for any type of outfit. 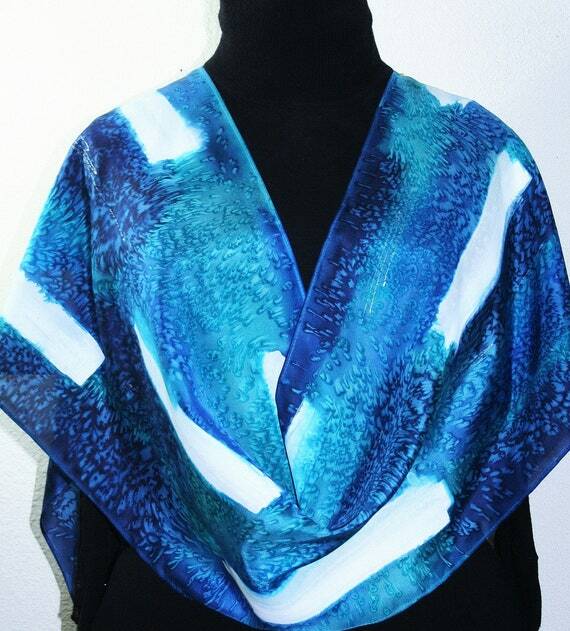 Silk Scarf Blue White Teal Hand Painted Silk Shawl CARIBBEAN CHIC, by Silk Scarves Colorado. Select Your SIZE! Birthday Gift, Christmas Gift, Anniversary Gift. Bridesmaid Gift, Valentine Gift. Gift-Wrapped. Elegant Handmade Silk Scarf. Hand Dyed Silk. Handmade in Colorado, USA. 100% silk. This is a 100% habotai silk (smooth silk) scarf, featuring melted brushstrokes in blue, turquoise, teal, and white. Decorated with thin accents in silver. It is a chic and elegant silk scarf, perfect for any outfit or as a beautiful gift to a dear person. Silk Scarf Terracotta Orange Red Hand Painted Shawl RED CANYON, by Silk Scarves Colorado. Select Your SIZE! Birthday Gift, Christmas Gift, Anniversary Gift. Bridesmaid Gift, Valentine Gift. Gift-Wrapped. Elegant Handmade Silk Scarf. Hand Dyed Silk. Handmade in Colorado, USA. 100% silk. This is a 100% Habotai silk (smooth China silk)scarf in hues of burgundy, terracotta, muted red, orange, golden and brown; decorated with accents in metallic burgundy and bronze. Silk Scarf Black Gray Hand Painted Silk Shawl Handmade BLACK NIGHT, by Silk Scarves Colorado. Select Your SIZE! Birthday Gift, Christmas Gift, Anniversary Gift. Bridesmaid Gift, Valentine Gift. Gift-Wrapped. Elegant Handmade Silk Scarf. Hand Dyed Silk. Handmade in Colorado, USA. 100% silk. 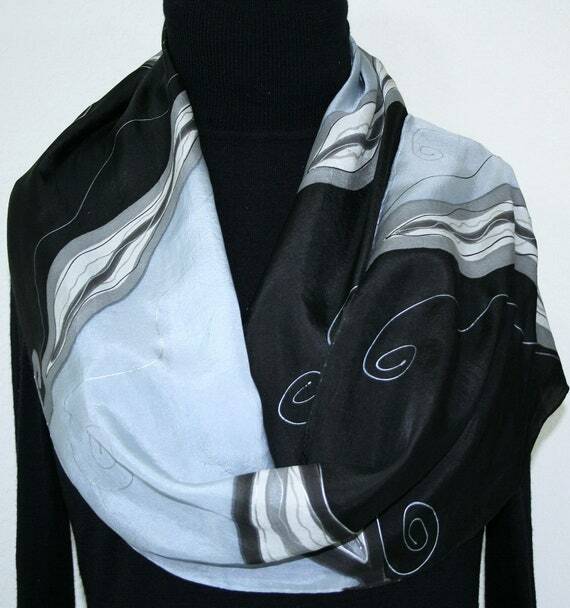 This is a 100% Habotai silk scarf featuring alternating segments in black and steel gray, separated by abstract shapes in pewter, decorated with gray, white and black. Silk Scarf Blue Green Periwinkle Hand Painted Silk Shawl TROPICAL JUNGLES, by Silk Scarves Colorado. Select Your SIZE! Birthday Gift, Christmas Gift, Anniversary Gift. Bridesmaid Gift, Valentine Gift. Gift-Wrapped. Elegant Handmade Silk Scarf. Hand Dyed Silk. Handmade in Colorado, USA. 100% silk. This is a 100% habotai silk (smooth silk) scarf, featuring melted segments in several shades of grey - dark steel grey, cool silver grey, and warmer taupe grey - with golden yellow for contrast. It is a chic and elegant silk scarf, perfect for any outfit or as a beautiful gift. - Size Skinny Long: 8" x 72" (20 cm x 183 cm). 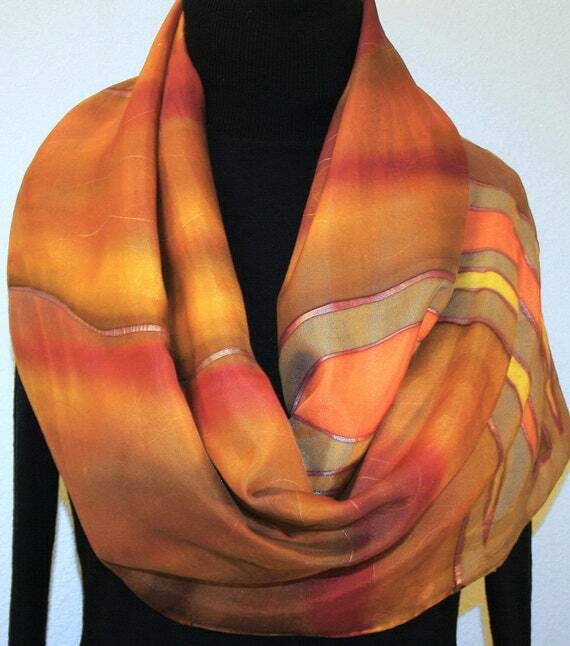 Silk Scarf Orange Red Purple Hand Painted Silk Satin Shawl BURNING SKIES, by Silk Scarves Colorado. Select Your SIZE! Birthday Gift, Christmas Gift, Anniversary Gift. Bridesmaid Gift, Valentine Gift. Gift-Wrapped. Elegant Handmade Silk Scarf. Hand Dyed Silk. Handmade in Colorado, USA. 100% silk. This is a very luxurious, 100% Silk Satin scarf, featuring multicolored splashes in shades of orange, red and purple; decorated with metallic lines in purple, bronze and gold. Silk Scarf Navy Blue Hand Painted Satin Silk Shawl SATIN FLOWERS, by Silk Scarves Colorado. Select Your SIZE! Birthday Gift, Christmas Gift, Anniversary Gift. Bridesmaid Gift, Valentine Gift. Gift-Wrapped. Elegant Handmade Silk Scarf. Hand Dyed Silk. Handmade in Colorado, USA. 100% silk. This is a 100% Silk Satin scarf - very chic and elegant, in shades of blue; decorated with abstract flowers in metallic blue. It is a very elegant scarf that would make a perfect accessory to a more formal outfit. NOTE: Please select your color of choice - royal and sapphire blue (see photos 5-8), or dark navy blue (see photos 1-4).